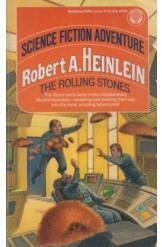 The Rolling Stones by Robert A. Heinlein, Sci Fi. The Stone twins depart across the solar system to start an interplanetary bicycle business, but are unexpectedly accomponied by their family. When their grandmother is lost and a Martian flatcat comes aboard their ship, things begin spiraling out of control. Book is in good condition, all pages intact.